I’m writing today in response to Wordsmith Studio’s Weekly Writing Prompt. Autumn isn’t so much a season here in the deep South as a blink, a held breath between our unbearably hot summers and what passes for winter. This year has been different, though. We’ve had pleasant days and cool nights since September (granted, with a few summer-like days thrown in). By Wednesday, we’re in for our first shot of “arctic” air: a cold front is headed our way, promising to drop our night-time temps into the twenties. The maple tree in the photo below is now bare, and the ginkgo trees down the street are not quite at their peak, but in a day or two, they’ll drop their leaves in a chorus of yellow, all at once, a carpet on the ground. I was already thinking about the change of seasons before I read the Wordsmith challenge. I love this time of year. It’s such a glorious season: the riot of color, a certain quality of light that renders everything sharper, the clean air. 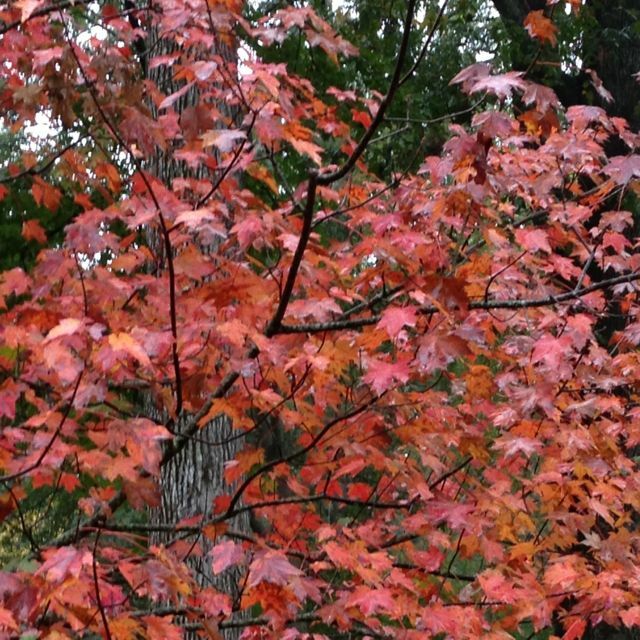 Autumn, for me, is almost one of those “thin places,” where the temporal meets the spiritual in an unexpected way. So why am I melancholy, I’m wondering. My mother died on an unseasonably chilly October night. She had been sick for three years, off and on, but the “terminal” aspect of her illness had lasted only a couple of weeks. I say only because I’d been told it could take months for the cancer, which had spread to her lungs, liver, and brain, to kill her. What awful weeks those were. Once I’d known her prognosis, I’d arranged to move her to a local hospital so I could more easily take care of her. All the doctors could do was try to alleviate her pain. I remember asking a friend to bring my younger boys to visit her in the hospital. (My two older sons were already away at college.) I thought it might lift her spirits. I helped Mother “primp”: I brushed her hair, put on a little rouge and lipstick. She looked awful by that time, and there was no disguising it, but for the children, she wanted to try. By the time I was done, she was exhausted. The boys came, and the visit was awkward, silent. Mother tried, she really did. But her eyes already seemed to look far away at something or someone I couldn’t see. A week later, my mother was dead. I sat with her in the last hours. One of the nurses told me to talk to her, to tell her it would be all right if she left me. And so I did. I told her it was okay to go, that my dad was waiting for her, that I would be all right. My sons, whom she loved dearly, would be all right. Her eyes, half-open, seemed to register nothing. I had never been in the presence of death before. Oh, my maternal grandfather, had died in the house when I was ten, but that was different. This time, I was in the room. Up close. A friend came to wait with me. I’d been told it would happen soon. I sat there, listening to my mother’s breathing that had gone shallow now, such a relief after the past two days when every breath had been a terrible struggle. And then, suddenly, the absence of breath. Silence. The nurse came and confirmed what I already knew. She and my friend left me alone with my mother for a few minutes. I was calm, struck only by how quiet it had been at the end, as though death was the most natural thing in the world, far less brutal that the slap on the bottom of a newborn. After the paperwork was done, about midnight, I walked to my car, alone. Cold, a gorgeous full moon shining. I would have to tell my children. I would have calls to make, and arrangements, but all of it could wait until tomorrow. I did not cry. I had already done a lot of crying in the previous days and weeks. I breathed in the chilly air. The moon and the beautiful night seemed like signs: of life and joy in the midst of death and sadness. Of gain and loss. Of earth and heaven, joined. So maybe that explains my love of this time of the year, even though it’s tinged with nostalgia. I love the passage of all the seasons, reminding me of the stages of life and how precious it all is. What is your favorite season? How does it feed your memory and your stories or poems? Gerry, I really loved the imagery you chose about the changing of seasons: the held breath, the chorus of yellow. Then, when you went into the emotional heart about your story, it really tugged me in. What an intense experience. Thank you for sharing with us. Thanks, Jennifer. This one surprised me; it almost wrote itself, and then I was wary of putting something so personal and emotional on the blog. But it felt right. Thank you for reading! Gerry,This is so beautiful. It too reminds me of a family member’s death: my father, who also died of cancer. I love the details you’ve included. A good description of how that illness affects the lives of the living and the dying. Thanks, Linda. I remember so much about that time–and carry much guilt (how could I have done things differently for my mother? But that’s a story for another time, maybe)–but walking out into the night has stuck with me. The darkness, and yet that beautiful moonlight. Thanks for the read and comment! Aw Gerry – those transitions and passings are exquisitely hard. My father died in a steamy August – but Autumn brings its own nostalgia – Beautifully written and – my heart moves toward you along with Sabra – Autumn is the time that reminds us the most of the passing of time and I think you captured that beautifully. “Autumn is the time that reminds us the most of the passing of time…” Yes, I think so. And yet, I love winter for much the same reason–the bareness in contrast to what comes in the spring. Thanks, Pearl, for reading. Oh, Sabra. So sorry to hear that. I hope this post also brought back some good memories.